Biography: Carmel Gospel Missions began in 2006 as a result of much prayer and a God-given vision to reach the unsaved. It started in a small house where 10 people attended. Today, 120 members worship together in their permanent church building in the remote village called Kamavarapukota. 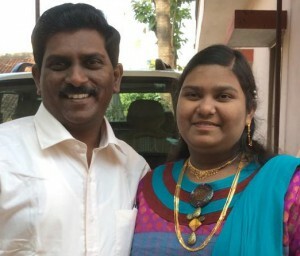 Throughout the years, Moses and Shaleam have baptized over 50 people who have come from idol worship, witchcraft, Hinduism and various economic levels. In spite of these oppositions, they remain steadfast in their stance for Christ. In addition to pastoring, Moses travels to various local churches where he preaches and interprets for international speakers. Strengths: Moses and Shaleam's passion is to change people's lives through meaningful sharing and demonstrating the Gospel of Jesus Christ.